Supplements: Garden of Life, Jarrow, Life Extension, Solgar, NOW, Thorne, etc. Natural Bath & Beauty: Aubrey Organics, Avalon Organics, Giovanni, Weleda, etc. Natural Foods: Atkins, Bob’s Red Mill, Frontier Natural, Lundberg, Navitas, etc. Sports Nutrition: BSN, MRM, Optimum Nutrition, Muscletech, Twinlab, USN, etc. Healthy Home: Attitude, Babyganics, Ecover, Method, Munchkin, 7th Generation, etc. Earn from buyers in Australia, Canada, China, Germany, Great Britain, Hong Kong, India, Japan, Korea, Russia, Singapore, Spain, Sweden, Taiwan, UAE, Ukraine, etc. 1. Do I need a website or blog to be an affiliate? No, you can refer your family and friends by email, Facebook, Twitter, or handing out physical coupons with your code. When your customers’ order, pending credits will show in your account. Thirty days later, those pending credits become available to use for your orders. Any unused credits will rollover to the next month. 3. Can I get paid credits or cash? If your available credit balance is less than $300, you can use it to order free products. Or if your available credit balance is more than $300 at the end of any month, you can receive cash by wire transfer to your bank. $120,344 average/year cash paid in 2015. $19,608 average/month cash paid in 12/2015. Plus in Dec. 2015, thousands of iHerb customers saved a total of Free50,665 in credits off their orders. 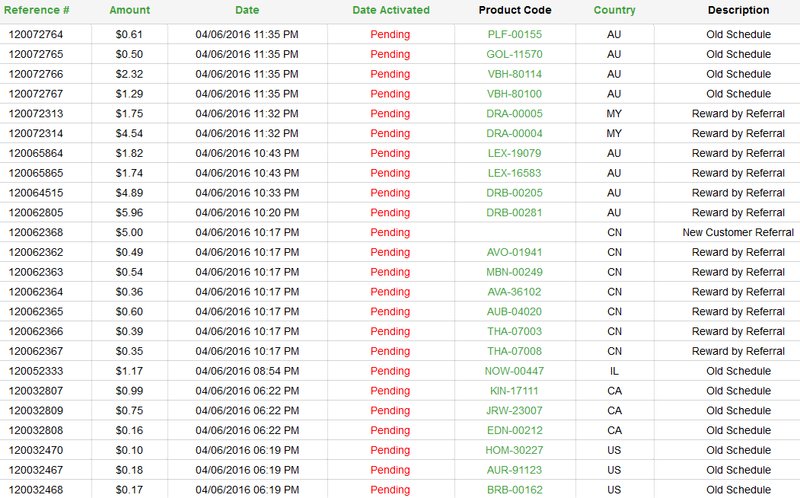 Below you can see how your commissions will look in your iHerb account. Notice the high international order rate, and the high reorder rate. iHerb Rewards, Health Affiliate Program is that simple. To get started, place your first order, then follow iHerb’s directions to get your 10%coupon code. Happy earnings! *Earnings Disclaimer: We have made every effort to accurately represent this business opportunity. There is no guarantee that you will earn any money. Examples and testimonies are not intended as a guarantee or promise of earnings. Your earning potential depends on your experience, knowledge, effort, and financial investment. Neither iHerb nor ComparingVitamins.com offer a legal pension. Commissions are for the life of the program. iHerb may terminate the program at any time for any cause, cancelling their obligation to pay lifetime commissions. Subject to iHerb Coupon Referral Program Terms and Conditions. Adsense is a trademark of Google. Thanks for asking about our free, custom ads for iHerb. Yes they are a very reputable vitamin co. And we will be glad to help you if you follow the directions at the end of the article above. I’d like for someone to get in contact with me regarding the affiliate program, please. I saw your website. Do you have questions about iHerb’s affiliate program? I’ll try to get an answer for you soon. P.S. Free international shipping special this month. I’m sorry for the delay. Please see iHerb Rewards updated commissions above. The new, affiliate commissions for level 1 include 40%, 32%, 16%, and 4%. probably in the correct category. But iHerb will clarify that later. If one is just starting out, which format may be best a Blog, Facebook, or standalone Website? I have had other websites, simple ones, I am good at writing (blog? ), I have researched and tried many various health products, protein powders, Vitamin Power etc., and health benefits. Just not sure where to start, which medium? I just saw your site and love the products. Any ideas?